Cacao medicine reconnects and heals mind-body-spirit-soul. This monthly circle offers a safe and sacred space to explore deep themes and questions, access inner wisdom and feel seen and supported by a community of soulful women. * Explore our relationship to abundance, intuition, vision, manifestation, inner healing, and creativity. Please bring a journal, pen, and water bottle. We are excepting registration until 5:30 due to cacao preparation. Nicole leads journeys to wholeness through inner wisdom practices, cacao medicine and shamanic drum journeys and transformational coaching. Cacao medicine has been her teacher, healer and guide (along with her spirit animals and higher guides). 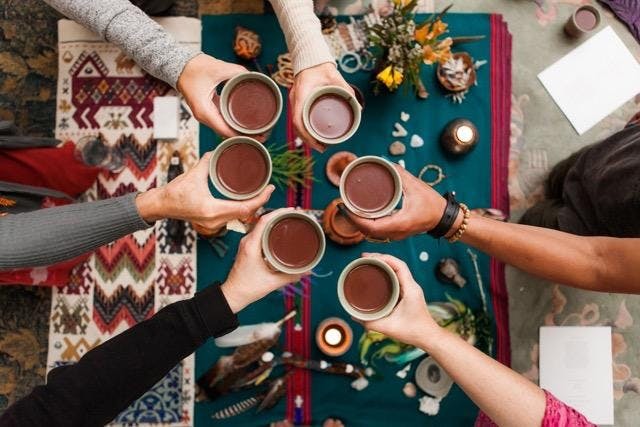 Cacao reconnects mind-body-spirit-soul and is medicine for the soul in a time of deep disconnection. In addition to her private offerings, she holds group cacao medicine journeys and ceremonies at Soulstice Mind + Body Spa in Sausalito and Heart Tribe in Fairfax; private 1:1 and couples sessions at Cavallo Point Healing Arts Center & Spa; and group experiences in private homes, businesses, and at retreats. In her deep commitment to “everything cacao,” she teaches and writes about cacao as a transformational tool in ceremonial and healing practices. Her blog and event schedule are at soulscapecoaching.com.